This article describes what Skid Plate racing is http://goo.gl/TfQnSz). After renting a car from the master of this type of crazy racing, Robert Rice for a past event, he told me we could put together my own car fairly easily. So we did! See the full post of the car build here. The first event with this car was a lot of fun but far from perfect. The car took a bit of damage but luckily it was mostly cosmetic. Robert Rice did a great job of getting the car back up and running. I also learned a lot about the car and how to go faster with the skid plates. We made a few minor tweaks to the exhaust system to help get a little more performance. I was looking forward to a strong practice/ qualifying session just to get back into things and see if I remembered any of the lessons from the last race. The car felt a lot faster after our tweaks and though I had a few spins, I did feel better on the skid plates. The session was shorter than expected and I never quite put together a great lap. I qualified mid-field – not great but around what I expected at this point. After the qualifying session it was time to head out for the autograph session. There was a great turnout and my awesome green Honda Accord race car seemed to be really popular. Again, many many thanks to Robert Rice Racing for helping me put together this car and to my friends and family who came out to watch. Posing w/ the car – sometimes better at this than I am at driving it . . .
My friend Sergio! Thanks for coming out! After qualifying I was feeling pretty good about the car. It was running well and I was feeling like a better driver. As we were lined up to go on track for our race, the car began to idle very slowly, as if it was going to stall. Giving it gas did nothing to help until the car finally did stall. We only had a few minutes before it was our turn to go on track but with a good hustle by my friend Alex and a few others we got the car quickly jumped. We left the car charging for as long as possible but the general feeling was the car had a bad alternator and was running off of battery this entire time. At the last minute, we pulled the battery charger off and the car seemed to be running ok. Once I entered the track I could tell something was wrong. I only made a few hundred feet when I could feel the car about to stall. 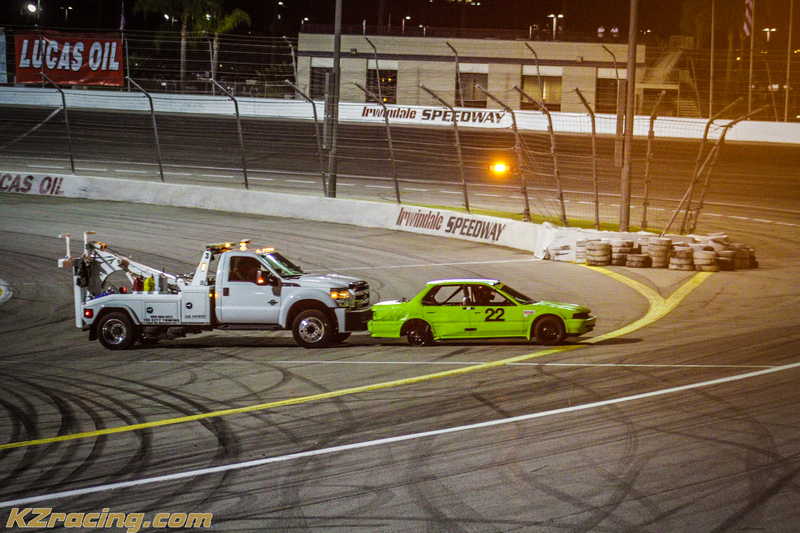 I pulled into the infield of the track to get out of the way and waited to be unceremoniously hauled off by a tow truck. A quick end to a really long day. Thanks again to Robert Rice Racing It was later confirmed that it was indeed a bad alternator. New one in, we will be back for more soon.